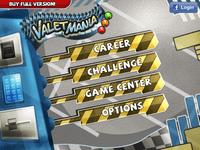 Valet Mania is an arcade-tactical strategy game based on the path drawing mechanic. The Player, as a Valet Parking Supervisor must manage the incoming and outgoing traffic, and avoid collision of the cars on the road and parking lot. The goal of the game is to run profitable Valet Parking business. Each car parked on a lot generates revenue. The customers who get their car pulled out of the parking lot on time are satisfied, and tip the Player. However, there is no payment, and an insurance penalty occurs when the player demolish or scratch a car. - Addictive arcade-strategy game play! - Variety of game play modes, endless fun!